Now wasn't that interesting. I'm talking about the new McVicar production of Puccini's Tosca in HD from the Metropolitan Opera. It was originally supposed to star Jonas Kaufmann, Kristine Opolais and Bryn Terfel, and its conductor would have been Andris Nelsons. So everyone is completely different. And now I'm going to be frank: I don't think anyone from the original cast could have improved on today's spectacular performance. So thank you all for finding something else to do today. Emmanuel Villaume replaced James Levine in turn and did well. First of all let's talk about the production which is a replacement for the unpopular Bondy production, which in turn replaced Franco Zeffirelli. Act I is remarkably similar to Zeffirelli. It takes place in a church in Rome which anyone may visit. Act II takes place in the Palazzo Farnese in Rome which is now the French embassy and cannot be casually visited. Unfortunately for me, my collection of books includes a photo collection of Palazzo Farnese. This means I know exactly what it actually looks like. None of these productions even remotely resemble it, but perhaps an exact portrayal would be distracting. The McVicar is like Palazzo Farnese seen by someone extremely near sighted. 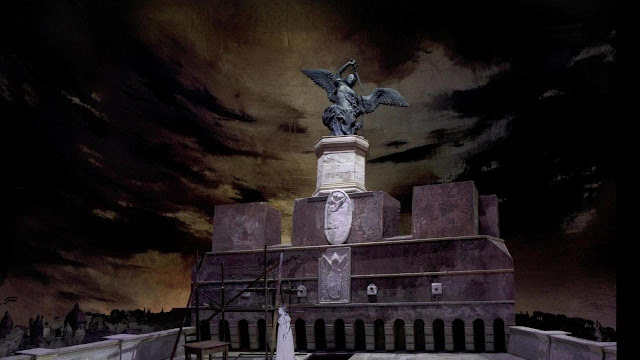 The third act shows us the roof of the Castel Sant'Angelo pretty much as it actually is. Why try to improve on perfection? For me all three of these sets, though large and difficult to assemble, functioned well as background for our story. It's traditional and fuddy duddy, but for me it works. Which brings us to our singers. Scarpia is the slimiest of slimy villain baritones, and Zeljko Lucic knows how to turn on his dark side. His voice is also good. While interviewing Sonya Yoncheva, Isabel Leonard exclaimed, "You are very brave!" 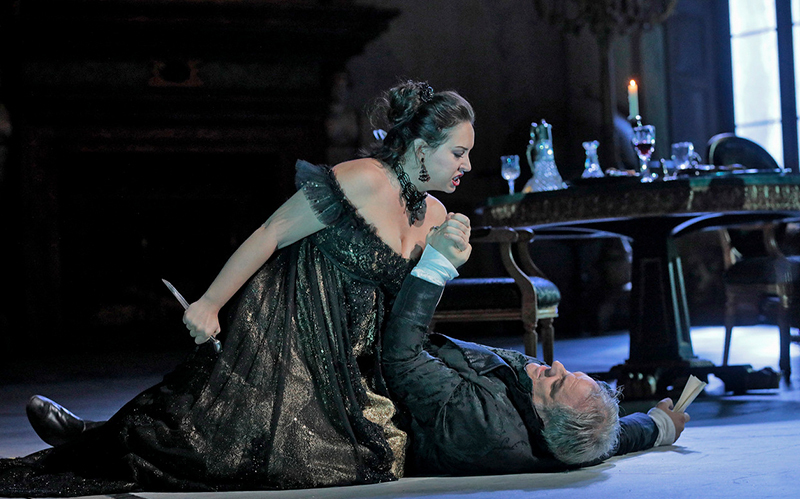 In this performance series Sonya made her debut as Tosca. That means she has never performed Tosca before. A debut in a leading role at the Metropolitan Opera and on the HD series. Yes. Very brave indeed. I have heard her only a few times, and this seems the role that most suits her dark voice. You will have noticed by now that I love best the dark voices. For my ears her sound most resembles Callas of anyone I have heard. Today she was simply glorious. Viva Yoncheva. I added her name to the singers list at the left.